The DateTimePicker control allows you to display and collect date and time from the user with a specified format. 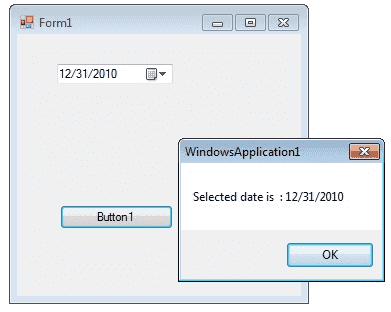 The DateTimePicker control has two parts, a label that displays the selected date and a popup calendar that allows users to select a new date. The most important property of the DateTimePicker is the Value property, which holds the selected date and time. The Value property contains the current date and time the control is set to. You can use the Text property or the appropriate member of Value to get the date and time value. The control can display one of several styles, depending on its property values. The values can be displayed in four formats, which are set by the Format property: Long, Short, Time, or Custom. How to find date difference ? How to to set datetime object to null ? The following C# program shows how to set and get the value of a DateTimePicker1 control.